JAMAICA IS THE CARIBBEAN ISLAND! LIKE NO OTHER ON EARTH WITH IT'S ENDLESS STRETCHES OF SILVER BEACHES AND SAPPHIRE SEAS. Jamaica is "Xaymaca", land of wood and water. Jamaica is "Reggae, Ska, Soca, and Rocksteady". Jamaica is "Kus Kus, Musmus & Patoo". Jamaica is "Jackfruit, Neesebery,Star Apple & June Plum". Jamaica is "Duckonoo, Dip and fall Back, Run-down & Blue draws". Jamaica is "Cease & Settle, Haul & Pull Up and Nuff Respect"
Jamaica is "Irie, Nyabingi, Boogooyaga & Legobeast"
Jamaica is "Kin-Puppa lick", "Rahtid"&"Gouzum". 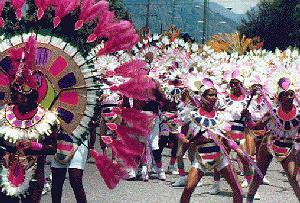 Jamaica is the largest and most westerly English speaking island in the Caribbean, 146 miles long and 51 miles wide. With low coastal plains and its best beaches on the north and west coasts, Jamaica is mountainous in the interior with a peak in the Blue Mountains of 7,402 feet. The climate is very tropical and perfect for vacations year round. For an update on the beach weather and the latest happenings see the Jamaica Tourist Board. 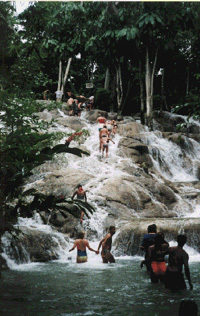 Jamaica is Waterfalls and springs, rivers and streams. 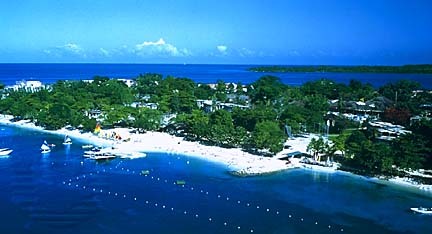 Jamaica has one of the richest and most varied landscape in the region. The great variety of terrain and climate allows virtually everything to grow there. Visitors can step into a country market and see a vast array of tropical fruits and vegetables with such names as - callaloo, dasheen, soursup, breadfruit ackee & otaheiti apple. Jamaica's main export (other than Tourisim) are bauxite, sugar, citrus fruits, bananas, spices and the world famous Blue Mountain Coffee. Jamaica is "Out of Many One People"; all over the island with natives of African, East Indian, Chinese, Europeans and many others making up the ethnic divisions of this country. The estimated population (July, 1996) was 2,595,275. Carnival is HOT! Don't miss it. Indeed, the Reggae riddims has been spread far and wide by its well known stars such as the Hon. Bob Marley, Peter Tosh, Jimmy Cliff & Marcia Griffiths and more recent popular artists such as Shabba Ranks, Buju Banton, Beres Hammond, Beanie Man, Sanchez. Patra and Lady Saw. Yes ! Reggae de bout! The Jamaica Tourist Board has the details on these happenings! For the Current Jamaican weather report go here! What to do in Jamaica:A calendar of current events. The Reggae Boyz latest news.